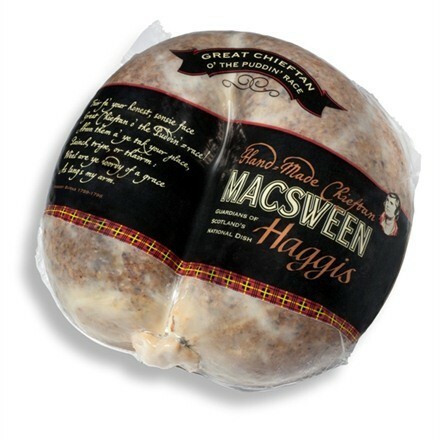 The chieftain haggis, also known as a ceremonial haggis, is the crowning glory of a Burns Night Supper. With its kidney-esque shape and outer animal skin (the only Macsween haggis to have this), it is the type of haggis Scotland's national poet, Robert Burns would have expected to see when he penned his famous poem ''Address to the Haggis"
Traditionally the chieftain haggis is piped in to an upstanding audience. The chef carries it in on a silver platter, behind the piper, and is followed by the person who will address the haggis. The appointed speaker gives a dramatic rendition of Burn's Address to a Haggis with a knife at the ready. After apologising for ‘killing’ the haggis, they then plunge the knife into the haggis and slice it open during the line ‘An' cut you up wi' ready slight'’ meaning 'and cut you up with skill’. The recital ends with the platter being raised above their head whilst saying the triumphant words ‘Gie her a Haggis!’ to rapturous applause. Macsween haggis, meat or vegetarian, is traditionally served with buttery mashed neeps and tatties and sometimes a whisky cream sauce. Lamb, Beef, Oats, Stock, Onions, Salt, Pepper, Spices.